One of the appealing aspects to backpacking is that you strip away all of the crap in your life—the minivan, the Netflix subscription, the constant barrage of emails, the walk-in closet, the spin bike, the flat-screen TV…strip it all away and get back to the basics of focusing on shelter and food while you’re immersed in nature. Some backpackers who spend months thru-hiking trails like the Appalachian Trail will even have trouble adjusting back into society after spending so much time in the woods with just a campfire for entertainment. Even spending just a couple of nights in the woods without the weight of modern life on your shoulders can be a regenerative experience that puts everything in perspective. All you really need to be happy is some food, a place to lay your head and a pretty view. Also, coffee. I’m all for using a backpacking trip to strip away the unnecessary layers of modern life, but coffee is extremely necessary. You can ditch the TV and the microwave, but dear god, don’t forget the coffee. We’re not animals. Luckily, there are a number of ways to get your coffee fix in the backcountry, ranging from chewing on whole coffee beans to elaborate percolating systems. San Francisco-based company Kuju Coffee makes Pocket PourOvers—disposable pouches with cardboard wings that fit over your mug so you can have a high-quality pour over on the road. These things are particularly handy when you’re backpacking and you want to keep your coffee kit to a minimum. They’re lightweight, come in individual servings and deliver a solid cup of coffee in the time it takes to pour hot water over the grounds. And when it’s all over, you have very little clean up to deal with. It’s a great system when you’re out in the woods. 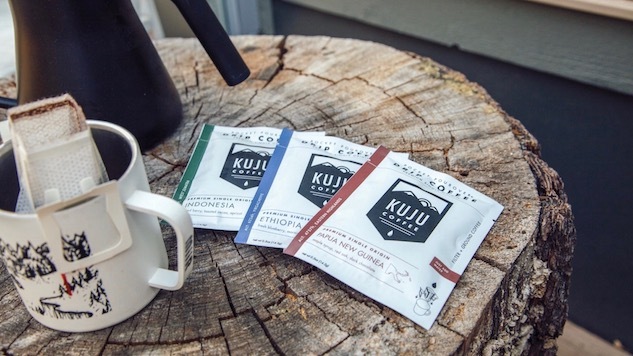 Kuju just took their portable coffee game to the next level by releasing a series of single origin Pocket PourOvers, with beans ethically sourced from Indonesia, Ethiopia and Papua New Guinea. I got to try all three and each has a distinct profile. The Ethiopian coffee brings waves of blueberry, the Papua New Guinea has a bit of bitter dark chocolate, and the Indonesia has more of a mellow cocoa vibe. They’re all great cups of coffee, but I think the Ethiopia ended up being my favorite after a back-to-back-to-back taste test. It’s a bright, almost citrusy cup of coffee that I think would be extremely welcome on a cold morning deep in the wilderness. Just as important as the quality of coffee in Kuju’s pour over pouches is the system itself, which is extremely easy to use (even a monkey like me can make a cup of pour over coffee) while still offering the quality coffee experience that we’ve all come to appreciate in recent years. The only problem with a pour over packet that’s already portioned and prepared for you is you can’t adjust the strength of that cup of coffee. I suppose you can make it weaker, but you can’t make it stronger. And Kuju’s pour over pouches have small openings, so you have to be careful when you’re pouring the water, because you don’t want to spill any water into the cup, which would result in a weaker cup of coffee. But a steady hand and knowing when to stop adding water to the pouch (fill it no more than four times) and you can dial in a fantastic brew. As you might expect, the single origin Pocket PourOvers are not cheap. A 10-pack of Kuju will cost you $22-$25. But you get what you pay for, and $2.50 is a small price to pay for a great cup of coffee when you’re 10 miles into a backpack and 50+ miles from the nearest hipster coffee shop. Bonus: Kuju Coffee donates 1% of sales to the National Park Foundation.